In the process of adding comments to yesterday's tasting. The French government announced on Tuesday 28th April that the reduction of TVA (vat) on restaurant meals from the current 19.6% to 5.5% will start on 1st July. See Euractiv here and La Nouvelle République. 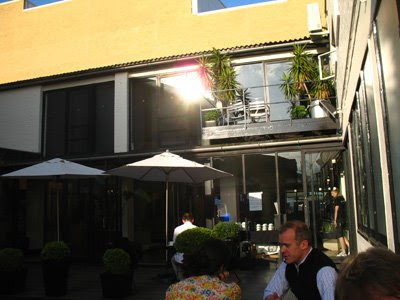 Despite speculation that some restaurateurs will not be passing on the reduction to their customers, I think there will surely be some reductions, whether it will be the full TVA cut is another matter. There is a French government site that may keep us informed about what is likely to happen. Have been off at two London tastings today. First 'Bordeaux Grands Crus Classés: 2005-2008' at the Portico Rooms, Somerset House. This involved ten Bordeaux châteaux, including Smith Haut-Lafitte, Canon la Gaffelière, Gazin, Angelus, Rauzan-Ségla and Leoville-Poyferré, showing their various wines. It was a welcome opportunity to have a rapid squint at the 2008s. I got here quite earlier but it was already fairly crowded and rapidly got fuller. Rather than taste everything I just concentrated on 2007 and 2008. On this showing, at least, I can't imagine why anyone bought 2007 Bordeaux en primeur particularly now that the 2008s, a better vintage is being offered for substantially less than the opening prices of 2007. Even though 2008 is better than 2007 I can still see no reason why it makes sense to buy 2008 en primeur, especially in these difficult economic times. Better to wait and see how the wines turn out once they are finished and not to take the risk of your chosen merchant or Bordeaux négociant going bust in the nearly two years before the 2008s are delivered. On the way down the Strand to the Portico Rooms I passed an Oddbins – the blackboard outside listed Oddbins red at £4.49 for a single bottle but only £3.59 as part of a mixed dozen. One of the noteworthy things about the press tasting was the high price for a single bottle purchase, whereas prices as part of a mixed dozen were much more competitive. Oddbins appeared to be trying to do a Majestic and encourage their customers to buy a minimum of 12 bottles. 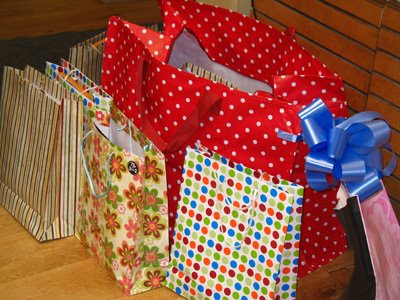 All very well if you have car parking facilities – extremely tricky parking in the Strand! So who, apart from a weightlifter, is going to buy a mixed case here in central London? Next up Les Caves de Pyrene's Real Wine tasting up at the Porchester Hall nearly Paddington. Les Caves is a marvelous antidote to the tedium of big brands and BOGOFs. On show today 56 producers making interesting wines with passion. 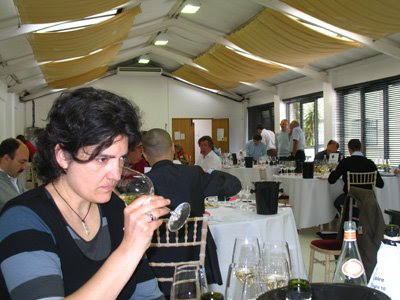 The tasting is on for two days and it would be easy and time well spent to be there for all two days – sadly deadlines makes that impossible. Instead I naturally concentrated on their Loire producers. I started with Frantz Saumon’s Montlouis and particularly liked the recently bottled 2008 Minérale +, Montlouis. Sec (£10.68 ext vat – same for all Les Caves prices quoted here) with has considerable weight but also mineral precision. Should be good to drink young but will also age well. 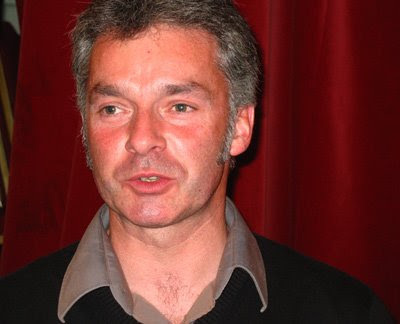 Then to Stéphane Cossais and two vintages of Le Volagre – 2007 and 2006. 2007 won’t be bottled until 8th December 2009 and Stéphane was regretting bring it along as it wasn’t showing very well. Anyway the impressive 2006 (£18.38) has the typical richness and concentration of this vintage. Stéphane and Frantz – "Yes you do look like José Mourinho's brother!" 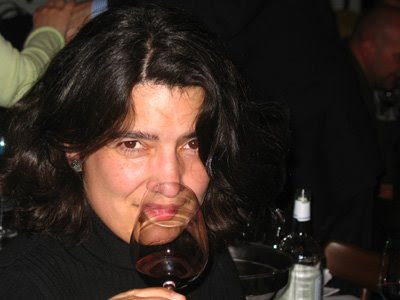 Next I moved onto the reds beginning with the 2008 Pétillant Naturel Boisson Rouge (£9.88) from Emile Hérédia (Domaine de Montrieux in the Coteaux du Vendômois). 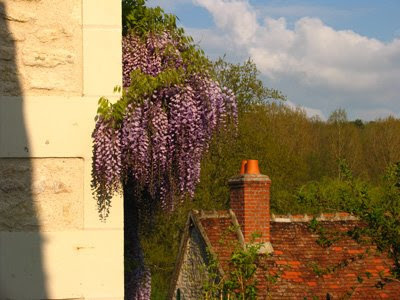 PetNats (pétillants naturels) are very fashionable in Touraine and the Valley of Le Loir at the moment. Their secondary fermentation relies on their being sufficient grape sugar left when the wine is put in bottle to provoke fermentation. 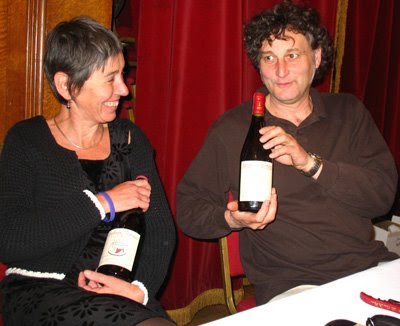 Emile’s Boisson Rouge is 100% Gamay and has soft attractive blackberry fruit – a good fun wine for the summer but at quite a serious price. The Hérédias have seven hectares of vines with three varieties planted: Gamay and Pineau d'Aunis for the reds and Chenin Blanc for their whites. Their 2005 Coteaux du Vendômois (£9.43) is 100% Pineau d’Aunis – typically peppery on the palate, while aromatically more discreet. Then onto three wines from Thierry Puzelat, who was yet to arrive although he was on his way courtesy of Ryanair. Of the three I preferred the delicate and spicy 2007 Touraine KO ‘In Cot we trust’ (£10.73). 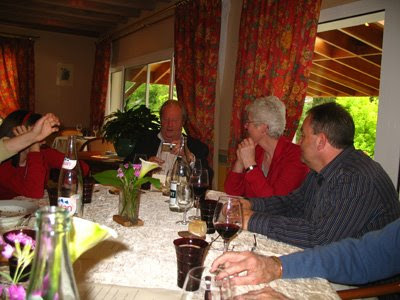 Thierry and the Domaine du Tue Boeuf in Les Montils have a Portes Ouvertes (open weekend) on 9th and 10th May. Other producers present include René Mosse (Anjou), Pierre Breton (Bourgueil, Chinon and Vouvray) and Pascal Potaire (Touraine). 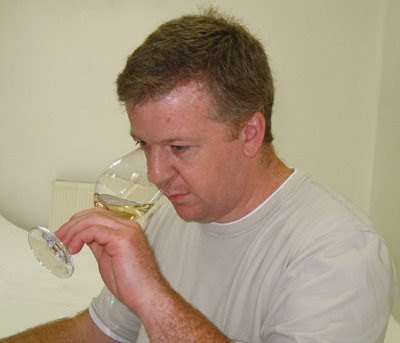 Thierry Germain (Domaine des Roches-Neuves, Saumur) wasn't present but the 2007 Insolite (Saumur Blanc £13.48) has the lean, minerla precision that Thierry is now looking for. The 'basic' 2008 Samur-Champigny has some attractive ripe fruit but quite marked acidity. Of the other wines 2007 Terres Chaudes (Saumur-Champigny £12.98) was a bit of puzzle with both bottles showing bitter, astringet fruit mid-palate. I thought the first bottle was slightly corked but the second proved to be similar. This may well have been a one-off but I hope it is not an indication that Thierry is pushing his current enthusiasm for picking very early slightly too far. 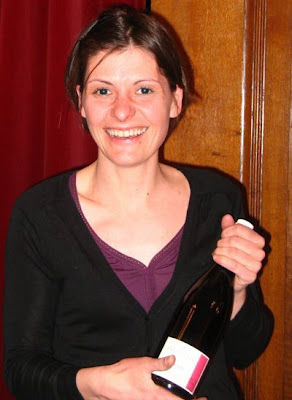 On to the Domaine la Chevalerie – a 33 hectare Bourgueil estate that impresses me and one that I ought to know better. First up the sweet, juicy fruited 2007 Binette (£7.48) from young vines grown on sand and clay. Amongst the range shown I liked 2006 Les Galichets (£10.63) – red and black fruits but needing time – and the same cuvée ten years on with its delicate, sweet evolved fruit and fairly priced (£12.18) for this 1996 – a lovely vintage now often drinking very well. 1998 Les Busardières, from 50-year-old vines on the clay-limestone coteaux, has initially supple fruit but has quite tight tannins reflecting this difficult vintage. 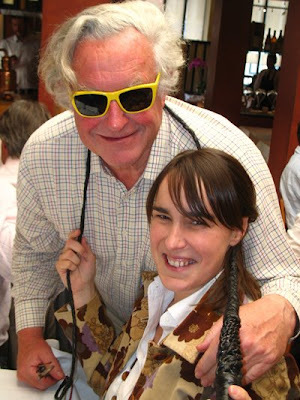 With Pierre Breton I tasted his fine 2008 La Dilettante Vouvray Sec (£9.78), made from bought in grapes, for the first time. 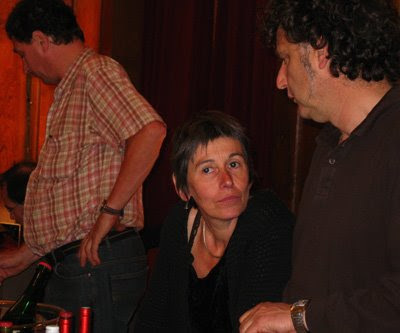 Catherine Breton is responsible for the vinification and it's a success with attractive quince fruit, good length and that touch of bitterness in the finish – typical Chenin. 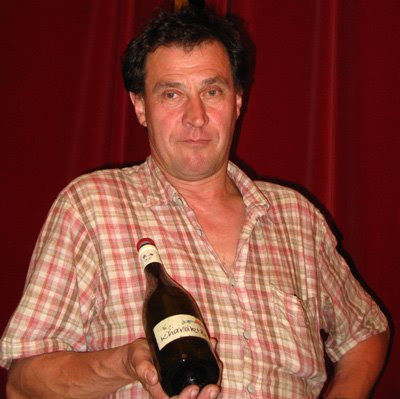 Pierre also has a 2007 Bourgueil Dilettante (£11.28), which is soft and supple. 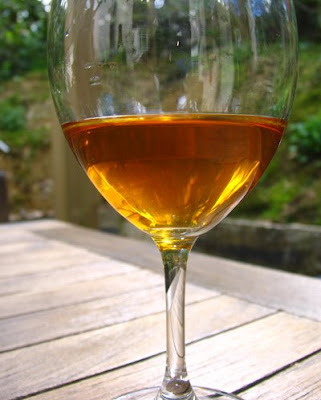 It is also made by Catherine, using carbonic maceration, but pricy for what it is. Similarly I have always thought the Breton’s entry level Bourgueil – Trinch (£9.78) – to be overpriced. 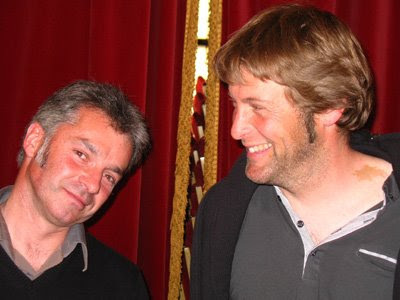 Of the three wines Christian Chaussard (Le Briseau), incidentally one of the initial guiding lights behind the PetNat movement, showed the 2006 ‘Kharakter’ Jasnières (£12.68) stood out for its balance and minerality on the palate. The 2005 Clos des Longues Jasnières (£16.28) is a considerable contrast with its richer, rounder fruit. 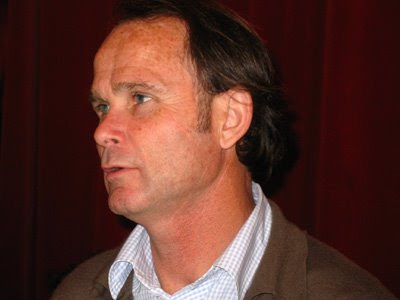 Paul-Henry Pellé was showing three Menetou-Salons – two whites from 2007 and the 2008 red. The Morogues (£10.58) and the Clos Blanchais (£12.88) both have the pure linear character of the 2007 vintage. I think it is worth paying a bit more for the Blanchais’ additional character and concentration. The 2008 Morogues red (£11.58) has attractive vivid, leafy young fruit. 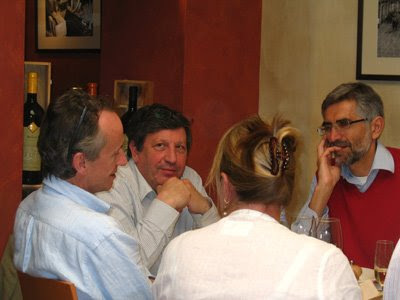 The Pelles’ 2006 Les Cris, their top Menetou red is currently showing very well, especially if served cool. There are some villages in the Loire where if you shout out a particular surname almost the entire population will appear and rush towards you. For instance, try ‘Mabileau’ in Saint-Nicolas-de-Bourgueil. In Sury-en-Vaux (AC Sancerre) the name to shout is ‘Riffault’. Here things are made even more complicated because there are two very promising young producers – both with a first name that starts with an S – Stéphane and Sébastien. Stéphane now looks after Domaine Claude Riffault, while Sébastien has a five-hectare property – 4.5 planted with Sauvignon Blanc and just 0.5 ha of Pinot Noir. I’ve been wanting to taste Sébastien’s wines for a while, so this was a good opportunity. If you are looking for a classic Sancerre, then you’ve come to the wrong place. Sébastien’s are richly fruited in a slightly oxidative style and have real character. 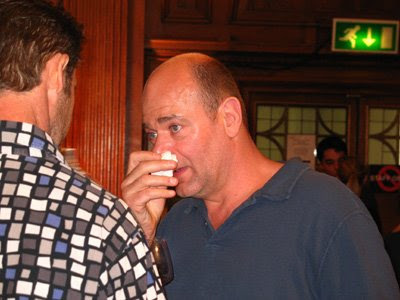 As well as his red (2007 Raudons £16.98), he showed 2007 Akmenine (£14.13 - caillottes) and 2007 Skeveldra (£16.98 – silex). Of the two, Skeveldra is the more mineral. 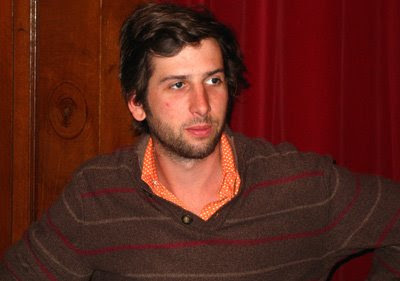 Sébastien is certainly working outside the norm and I must try to get to see him some time this year. 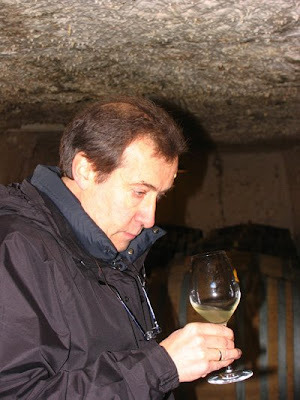 See profile of Sébastien on Bernard Celce’s wine terroirs site. 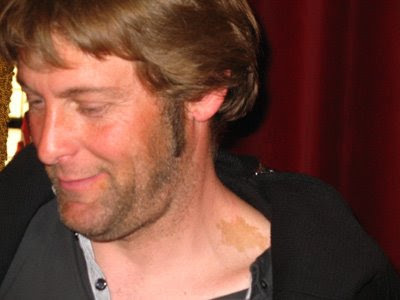 The legendary but unwell Eric Narioo (Les Caves de Pyrene) – no swine flu here please! 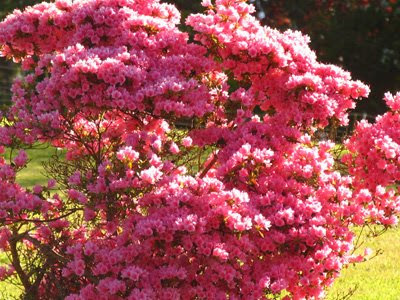 The 18th edition of the annual garden festival at the Château de Chaumont starts today. This year's theme is colour and there are some 20 different gardens. The festival continues until 18th October. This extensive garden festival is always worth visiting even if the quality of the gardens varies from year to year. 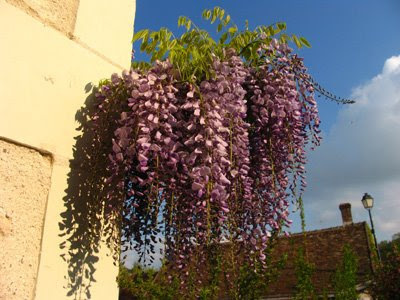 La 18e édition du Festival international des jardins de Chaumont-sur-Loire commence aujourd'hui. Cette année, les couleurs sont à l'honneur. More details on the Chaumont site. Disappearing bees and butterflies – a common cause? 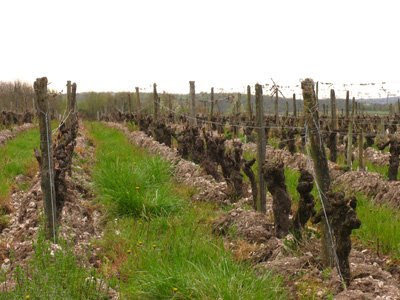 A Touraine vineyard stripped of its biodiversity: irrespective of economic imperatives how can this be the best long-term approach? The orange plague stretches as far as the eye can see. Two stories this week (Monday and Tuesday) on successive days about disappearing butterflies and bees – see below. The first about butterflies disappearing from the UK and the second about the threat to bees within Europe. Doubtless the causes are complex and there is not just one sole factor at play here. However, the widespread use of insecticides and herbicides would seem to be one of the major contributory factors – not least the consequent destruction of biodiversity. BRUSSELS, April 27 (Reuters) - Europe's beekeeping industry could be wiped out in less than a decade as bees fall victim to disease, insecticides and intensive farming, international beekeeping body Apimondia said on Monday. ... but if you go out for a walk today, you will be lucky to spot one or two. Patrick Barkham, who has been a passionate lepidopterist since he was eight years old, laments the dramatic decline of these most extraordinary insects – and wonders if there is any chance of saving them. Fortunately there are some positives in the Loire, for example the biodiversity programme in the Saumur-Champigny appellation, where the producers have worked together to provide habitats – hedges, woods and rough pasture – to encourage insects and animals. 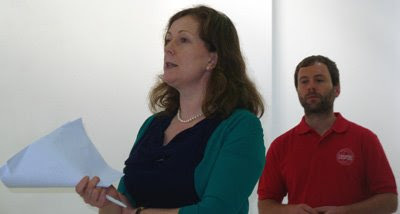 What is needed is a programme to encourage other Loire appellations to take this on and where necessary to provide the financial and logistical support to make this feasible. After all there are few appellations outside the Central Vineyards, particularly Pouilly-Fumé and Sancerre, that sell as well as Saumur-Champigny. One of the significant objectives of the biodiversity scheme is to encourage predatory insects that prey on insects that are pests or threats to the vine, so although there may well some altruism here there are also solid commercial reasons for the Saumur-Champigny producers to work together. Les 7 et 14 mai, réservez dans l'un des 28 restaurants partenaires de l'appellation Touraine: un verre de Touraine effervescent vous sera offert. Ces vins issus du chenin expriment des senteurs délicates de brioche, de pomme verte et de miel. 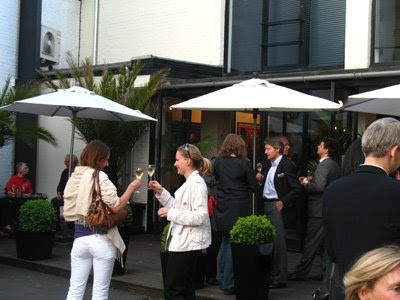 Touraine au restau: Thursday 7th and 14th May selected restaurants in the Loire (Tours, Blois and Orléans) will be offering a free glass of sparkling Touraine. 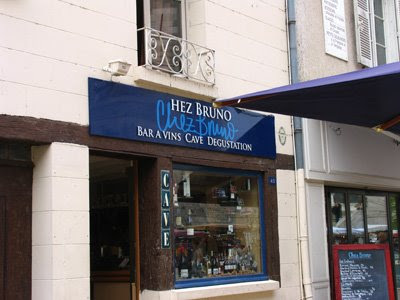 7th May: there are 14 restaurants involved in Tours including Au Martin Bleu, Brasserie de l'Univers, Le JaJa, Le Petit Blanc and Le Singe Vert. 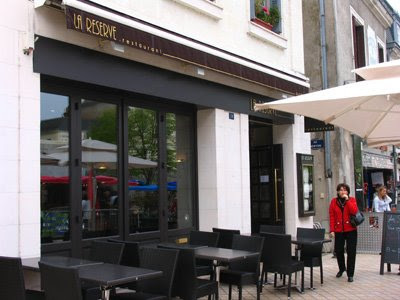 14th May: involves three restaurants in Blois, four in Orléans, six in Tours and one in Chambray-les-Tours. Find the list of restaurants here. Quatrième édition de la Grande Marche du Lochois, ce vendredi, organisée par Loches Développement. Au programme : quatre circuits de 8 à 37 km. A return to Parsons Green this morning for a tasting of rosés from Provence – Côtes de Provence, Coteaux d'Aix en Provence and Coteaux Varois en Provence. 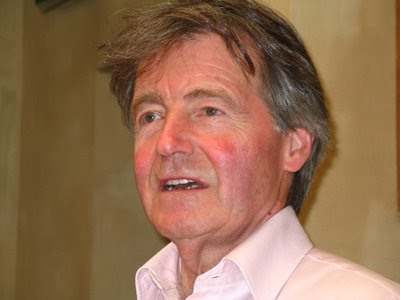 Incredibly of the around 80 wines in the tasting a maximum of four were closed with a screwcap – completely stupid if the producers of Provence rosé are serious about increasing their share of the UK market. There is still plenty of room for debate over whether screwcap is the best closure for wines designed for long aging but I think there is little doubt that screwcaps are the best option for wines that will be consumed quickly and informally. Screwcaps make these wines easy to open and to seal – ideal for picnics or busy restaurants. They avoid cork taint – much more apparent on a delicate rosé than a robust red. Furthermore major UK retailers now expect screwcaps for these types of wines as both Nick Room (wine buyer for Waitrose) and Chris Hardy (head wine buyer for Majestic Wine Warehouses) confirmed at the tasting. 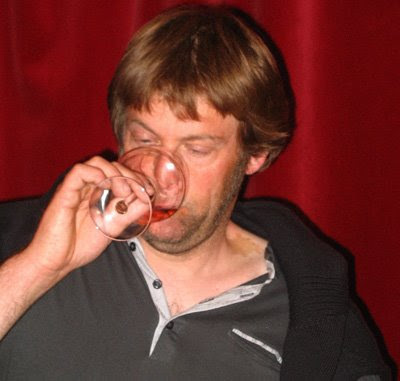 I suspect that once again the tyranny of the French sommeliers and their resistance to screwcaps bears a significant proportion of the blame for keeping Provence rosé producers behind the times and crippling their UK export drive. The Provence rosé producers are continuing their misguided campaign against blending white and red wine to make rosé – long standard practice in Champagne with a petition here. Although this morning there were some pleasant enough rosés, many of the 80 odd rosés shown this morning were pretty bland and anonymous. Fine on a fine day in a restaurant on the Côte d'Azur with some grilled fish but hardly worth rushing to the barricades for even if their future was threatened by the new proposals – which it is not. This evening happily drinking and enjoying Frédéric Mabileau's 2008 Osez Rosé de Loire with its attractive pear and red fruits flavour and fresh finish. 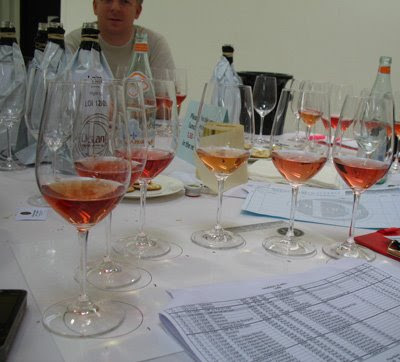 12% alcohol compared to 13% or more for most of the Provence rosés. Fellow writer, Hervé Lalau, has another posting on the rosé controversy. This time from a Swiss perspective. 1919 Le Mont: 90 years young! Yesterday was my father's 90th birthday and we celebrated with a party: 44 of us – extended family and friends. 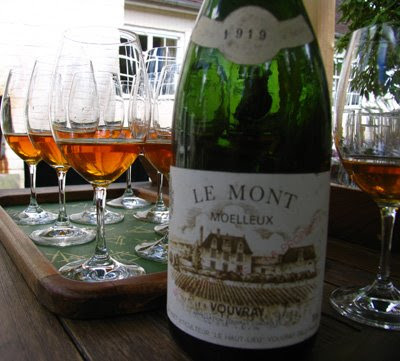 Today we have a brunch with this 1919 Le Mont Moelleux as the aperitif. It will have to go around 12, so it will be a generous tasting sample each and I hope the wine will be OK as I have yet to pull the cork. The level looks good only slightly down and the wine appears clear. 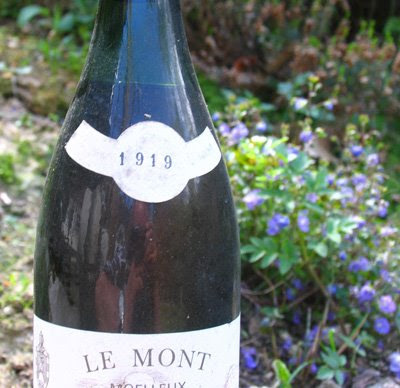 This Le Mont predates the founding of Domaine Huet, which happened nine years later. 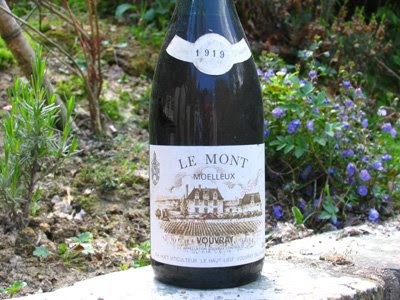 As I hoped the 1919 Le Mont turned out to be a remarkable wine as youthful as the amazing 1924 Le Haut Lieu Moelleux tasted in May 2004 at the Christie's pre-auction tasting. Although a a little less perfumed than the 1924, the 1919 had similar vitality and, at just under 90 years old, has remained incredibly youthful. Mild gold, crystal clear and lightly viscous, complex honeyed nose with touches of sous bois which gave way to notes of sweet almond and citrus fruit. Very little noticeable oxidation. Honeyed mid-weight on the palate with long clean, citric finish. Some of us managed to keep some in the glass for well over 30 minutes and it showed no sign of of tiring. Poured blind it would I'm sure to impossible to think that this Le Mont is effectively 90 years old. Instead one would be more likely to guess that it was 25-35 years old. Today we finished the 2009 Decanter World Wine Awards judging with the regional chairs judging the regioanl trophy wines to discern the International Trophies. 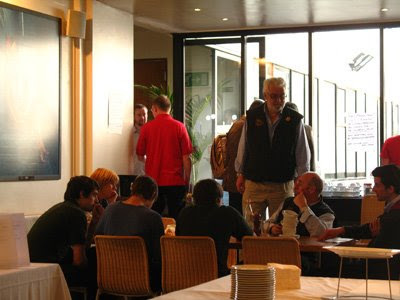 Once the judging was concluded we headed over the Thames to Putney for a very good and relaxed lunch at the Enoteca Turi in Putney High Street. 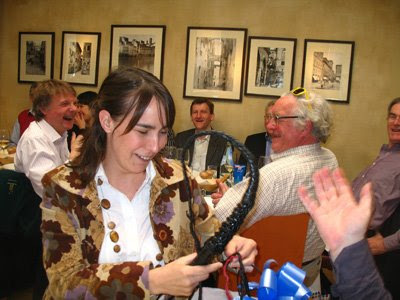 As usual the lunch featured several, light-hearted awards presnted to the judges by Sarah Kemp. 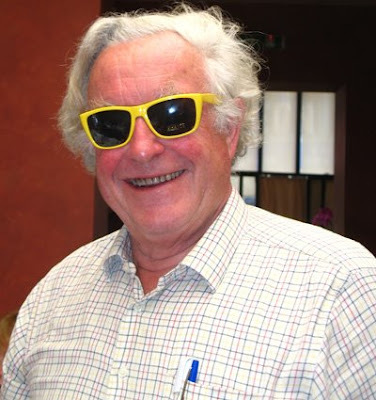 Chris Kissack has posted a reflective report on his site on judging on the Loire panel at the Decanter World Wine Awards. I was delighted to have Chris on the panel this year (although I'm not sure where he got the idea that only regional chairs can use cameras) and I thought that panel worked very well together. Another busy day's tasting at the Worx with an early start (9am) ensuring that we finished the remaining wines in good time. Today we had an encouraging line up of Sancerre and easily the largest entry of Loire reds in the five years that the Decanter World Wine Awards have been running. One of the features of this year has been the number of corked wines from the Loire – around 6.6% of the wine we tasted. 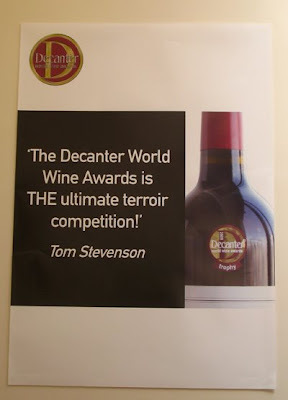 As reported yesterday entries to the Decanter World Wine Awards have passed the 10,000 wine mark – around 10,200. Apparently entries are up by 11% overall with the number of producers entering wines up by some 20% – all very encouraging in these recessionary times. Tomorrow all the the regional chairs will meet to judge the regional trophies to select the international trophy awards. There are a number of interesting contrasts with the other significant wine competition to be based in the UK – the International Wine Challenge (IWC) not least that the driving force of the team behind the Decanter awards are female, whilst it is male for the IWC. Busy day's tasting for the Loire panel (Sarah Ahmed, Chris Kissack and Nigel Wilkinson with myself as regional chair acting as arbiter when the three judges differ) at The Worx, Parsons Green in West Landon We started with some fizz including some Crémant de Loire. Then onto a series of Sauvignon Blancs: starting with vin de pays, then Touraine, Quincy, Menetou-Salon, Coteaux-du-Giennois and then Sancerre. Next some Muscadet before finishing with a range of Chenin – dry and sweet. Apparently once again the number of wines entered has risen – now over 10,000. As the number of judges has had to be increased, there now has to be two sittings for lunch! Tomorrow will be some more Sauvignon Blanc including Pouilly-Fumé and Sancerre before the biggest entry (most welcome) of Loire reds in the DWWA's five year history. 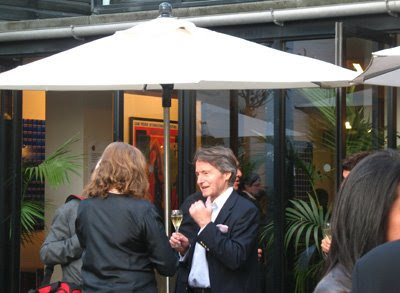 Tonight was the judges' party enjoyed in lovely balmy April conditions. 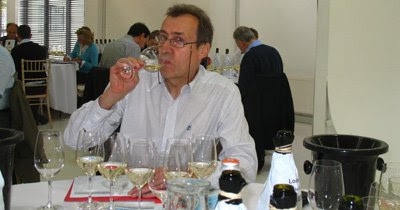 Off tomorrow to the Worx in Parsons Green to judge the Loire entries for the Decanter World Wine Awards 2009. 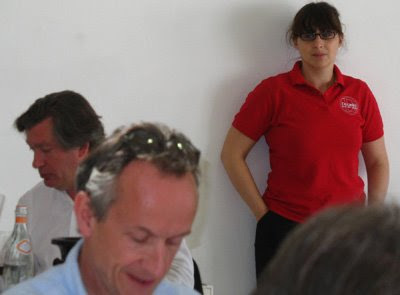 I'm the regional chair for the Loire and on my distinguished panel this year we have Sarah Ahmed (the wine detective), Chris Kissack (the wine doctor) and Nigel Wilkinson (RSJ Restaurant). We'll taste the Loire entries tomorrow and Thursday. Then on Friday the regional chairs judge the trophies. This is a useful eight page study on viticultural practices in the Loire. 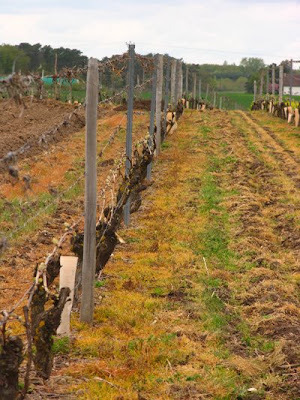 It provides details on the use of various viticultural practices in the Loire including grassing over, herbicides, fungicides and insecticides. Le paysage phytopharmaceutique est en évolution rapide. Ainsi dans le cadre du plan ECOPHYTO 2018, trente des cinquante-trois substances actives jugées les plus préoccupantes ne sont plus utilisables depuis la fin 2008. Ainsi, une partie des molécules utilisées sur la vigne en 2006 ne sont plus disponibles pour l’utilisateur (diuron, méthomyl, fénarimol, fluquinconazole, procymidone, fenbutatin oxyde, ...). D’autres substances actives vont par ailleurs connaître en 2009 leur dernière campagne d’utilisation (carbendazime, dinocap, ...). Si d’autres solutions techniques existent d’ores et déjà et sont parfois largement mises en œuvre, le paysage phytosanitaire va nécessairement se redessiner. It also has interesting figures of the popularity of grape varieties in the Loire, not including the Central Vineyards. I'm surprised that the area of Cabernet Franc planted is higher than that of Muscadet, though I suppose that almost all the plantings of Muscadet are concentrated in the Loire-Atlantique. Latest news on the fraudsters, who claim to work for legitimate wine companies, try to order wine and then disappear with the wine but without paying. 'Just wanted to inform of you of the latest scam apparently the initial emails seem to come from Slovakia, hence the SK at the end of the email address. 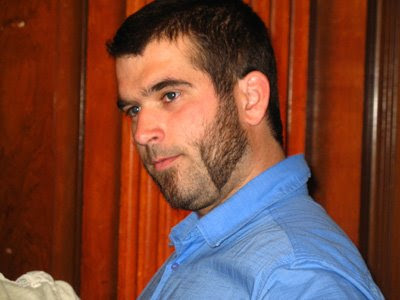 See also a story on decanter.com last Friday on producers being stung by these fraudsters. 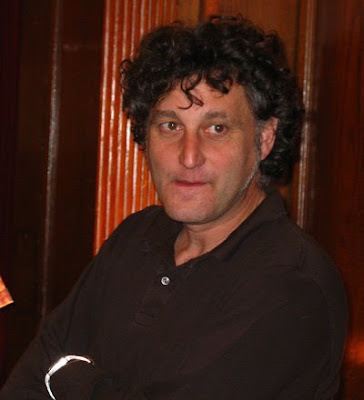 plus a posting on Leon Stolarski's blog on bogus orders and wine fraud. 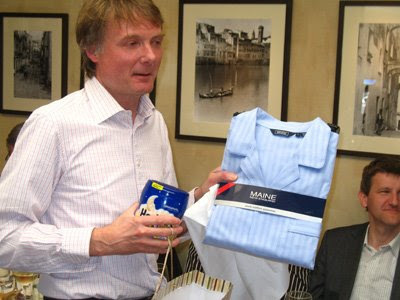 plus a new entrant – a Dave Green who claims to work for Hayman Barwell Jones (HBJ Wines). This company went into administration on 15th January 2009 and is now called Wine Company Realisations Ltd.
avec votre domaine pour la distribution de vos millésimes au Royaume Unis. Prière de nous faire parvenir vos tarifs et vos quantités disponibles. domain for the distribution of your years in United Kingdom. Prayer to send us your price lists and your available quantities. 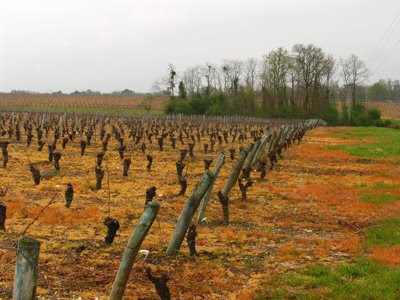 * Clarification: Although the figures would appear to be correct coming from the French Ministry of Agriculture and Fisheries, they refer to the incidence of the use of weed killers in French vineyards and are not necessary the sole means used to control weeds. 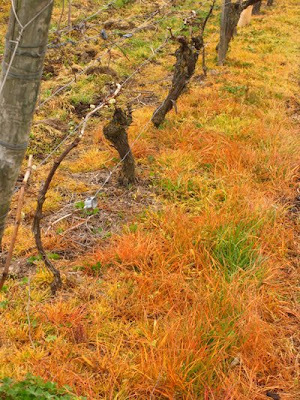 For instance the vineyard might to be partly grassed over with weed killer used under the vines. 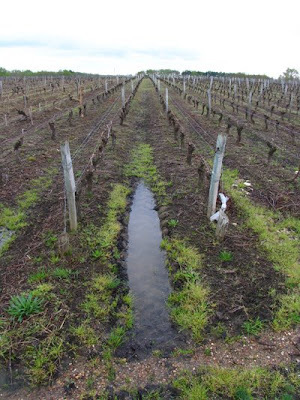 Although it has been pretty dry in the Loire since Christmas, there was enough rain the day before to produce this puddle in this compacted, weed-killered vineyard in Les Montils in AC Touraine. The adjoining vineyard, which belongs to the Puzelats (Domaine de Tue-Boeuf) and which is cultivated, had no standing water. It is clear that the soil of this vineyard has been compacted by heavy tractors – a tyre mark is clearly visible in the puddle – and that water cannot drain into the soil. This is another example of a disadvantage of using weedkillers especially if heavy tractors are also used. 'God save the King' – originally French?